The church is situated on a hill above the village of Ladock in a small churchtown consisting of school, Georgian old rectory and glebe farm with a modern rectory and a few more recent buildings. 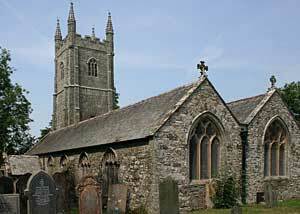 It is a two aisled church, with a fine Cornish granite three stage tower with four pinnacles. The church is dedicated to St Ladoca, who may well be a Cornish saint. A quarter of a mile away in the valley beneath the church is her Holy Well, recently restored. The structure is basically late 15th and early 16th century but there are traces of a Norman building and the whole is on a site where there was a church in pre-Norman times. There have been Rectors of Ladock since 1268 and all the incumbents are listed on two decorated panels in the Trethurffe Aisle. In the 19th century, the church fell into some decay and was substantially restored in 1864 by the then Rector, Canon Wise, entirely at his own cost. He employed the well known architect G.E. Street. Views have been expressed, particularly by John Betjeman, that it was over restored but it saved the church from dereliction. The main aisle had an entirely new roof but in the South Aisle some of the old barrel roof timbers were preserved and retained. The old box pews were taken out and replaced with pine bench pews. One of the best parts of the restoration was the East window by William Morris in 1864. There is also a decorated altar frontal with panels painted by E. Fellows Prynne installed in 1897, in memory of Canon Wise. There is an alabaster reredos behind the altar. There are two other windows of note. The East Window of the South Aisle installed in 1869 is by Burne Jones and the West Window, in the Baptistery installed in 1899 also designed by Burne Jones, the work of both windows being carried out by Morris and Co. and installed in memory of the Wise family. There are very few Morris and Burne Jones windows in Cornwall. The font in the baptistery is Norman of Purbeck stone, like Fowey, and with Grecian style palmettes. The church is well maintained and the roof covering was entirely renewed in the 1990s. It is a fine example of a Cornish parish church.